Malanga root is the rhizome, or stem, of a plant known for both its ornamental value and its edible ‘cormel’. 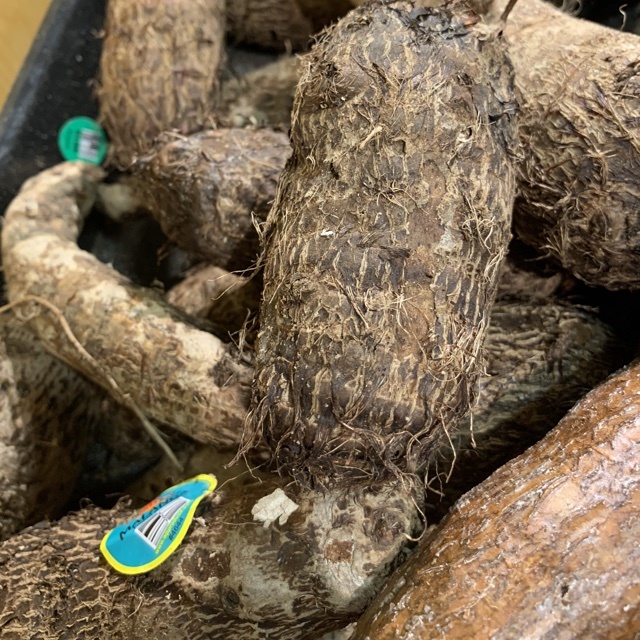 Xanthosoma sagittifolium is popular as an ornamental plant, and is more commonly known in the garden world as “elephant ear.” At the base of the Malanga plant is the corm, which is similar to a bulb or tuber and is the underground stem of the plant. From this central corm, smaller cormels grow in clusters. The stems and leaves of the Malanga plant can grow up to five feet in height with well-recognized, large, arrowhead-shaped (sagittate) leaves, which led to another alias for the tuber: “Arrowhead root.” Malanga’s leaves are edible when young, and are used like spinach. The tuber looks similar to a yam with an earthy brown skin and a conical shape. The size can range anywhere from one half to two pounds. Malanga root is often covered in patchy areas of brown shag over its variegated skin. The thin skin is often patchy as well, revealing the beige, yellow or reddish flesh (depending on the variety) beneath. The flesh is firm and crisp like a potato’s. 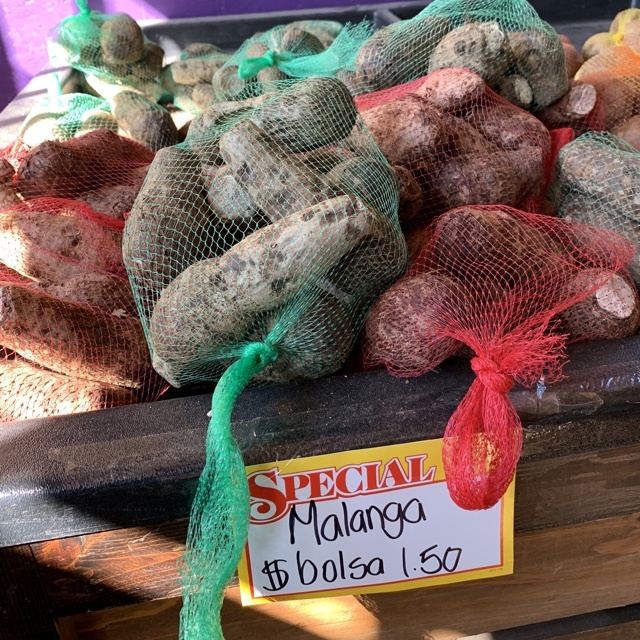 Malanga’s flavor is often likened to that of a nut, versus that of a potato or yam, once prepared. 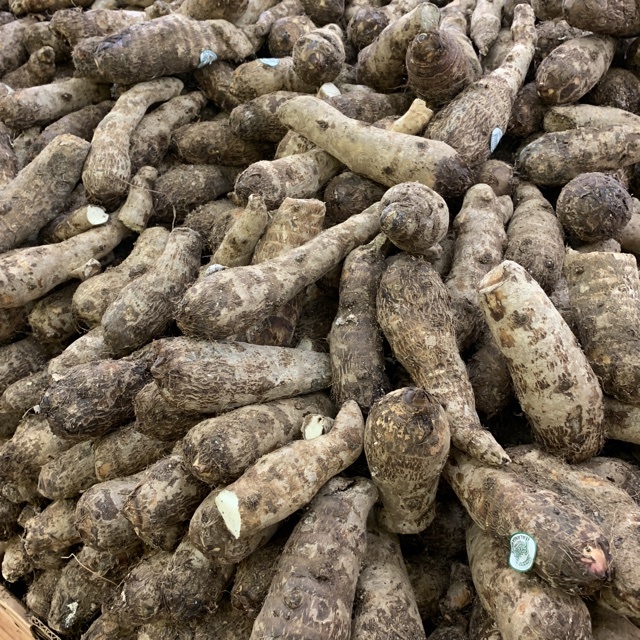 The taste is certainly unlike that of most tubers or roots, and lends well to Malanga in flour form. Malanga root is available year-round. Malanga root is a rhizome often mistaken for its cousin, the taro root. Botanically, it is called Xanthosoma sagittifolium and there are several varieties, broken down into four distinct species. These species are extremely difficult to differentiate and are often simply referred to as X. sagittifolium by most botanists. 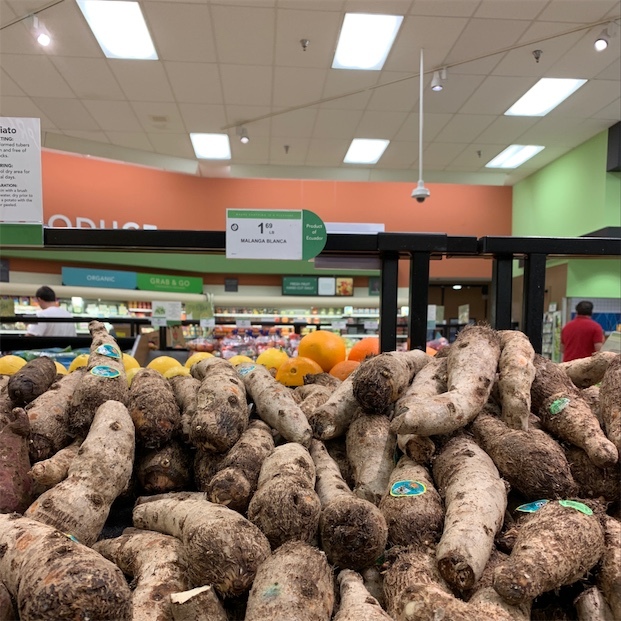 Malanga is known as Cocoyam and Yautia in parts of South America; in the Dominican Republic its known as Tannia and is referred to as Taniera in the Bahamas. Malanga is high in fiber and calories and is a good source of riboflavin and folate. Malanga provides a modest amount of iron and vitamin C, yet is richer in minerals than a potato. The Central American root is likely one of the most hypoallergenic foods in the world. Anyone with extensive allergies should be able to tolerate Malanga flour. Malanga has smaller and more easily digestible starch grains compared to most other root vegetables. Malanga and most species in the Araceae family contain calcium oxalate and saponins, irritants and bitter toxic compounds which can be destroyed through cooking prior to eating. 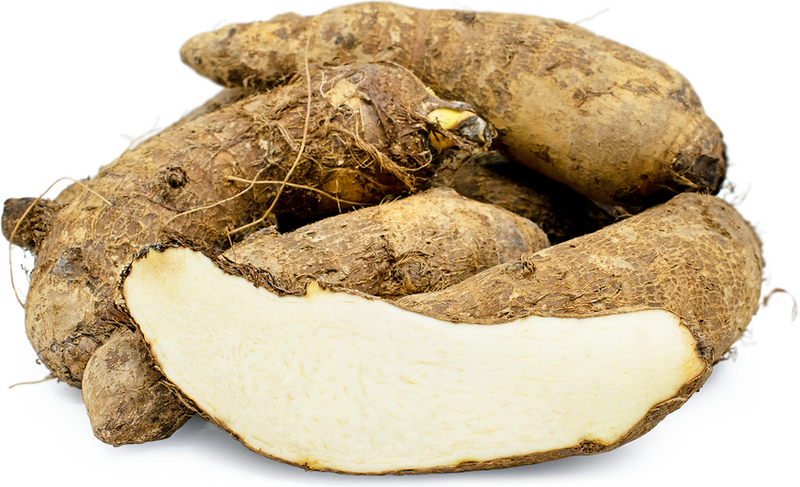 Malanga root can be used much like a potato, yam or other root vegetable. It should be cooked prior to consuming. It can be peeled and sliced and fried as chips, or boiled and pureed for a creamy hot or cold soup. When the root is overcooked it disintegrates, making Malanga root a natural thickener to make stews creamy. In many countries, Malanga root is simply peeled and boiled. It is typically served with salty, dried meats and fish or spicy sausage. 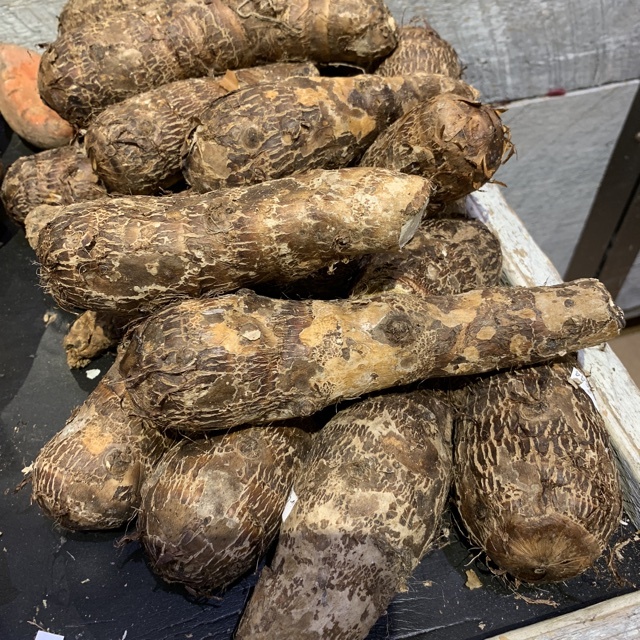 Boiled or steamed Malanga can be mashed with butter and cream to use as a side dish, or cut into pieces and roast with salt and pepper like fries. Grate Malanga when fresh and mix with flour, egg and herbs and form into patties to make fritters. To prepare: scrub the root with a brush under running water, trim ends and remove the skin. Rinse each piece after peeling and cover in cold water. Once prepared, Malanga can be kept refrigerated for up to a day before cooking. Fresh Malanga root should be stored at room temperature, and not below 45 degrees F, and should be used within a week. Malanga root can be dried and ground into flour. Malanga flour is a good substitute for wheat flour for those who are intolerant to wheat or gluten. Malanga is native to the tropical central and northern parts of South America, where it is still quite popular. It was first domesticated in Central America, where it was discovered by Spanish explorers and brought with them to parts of the Antilles – the Dominican Republic, Haiti and Cuba, and eventually to West and Central Africa in the mid-1800s. 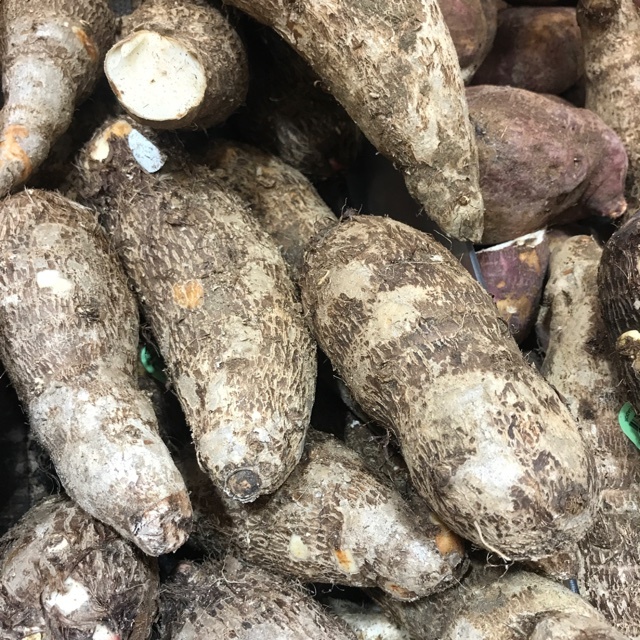 Malanga, or Cocoyam, is a staple root vegetable in Africa, Oceana and Asian tropical regions. Once species, Xanthosoma violaceum with a yellow flesh, is grown in the Philippines. The high caloric content and nutritional value made Malanga an important subsistence crop in areas of drought or famine. The Malanga or “elephant plant” can grow in both marshy and flooded areas, as well as in upland areas where rain maintains its growth. The growing environment is dependent upon the species, but it is a hardy plant overall. Commercial production is generally concentrated in Central America and the Antilles. Malanga is available in most specialty food markets, or in farmers markets in tropical and sub-tropical areas.  Recipes that include Malanga. One is easiest, three is harder. People have shared Malanga using the Specialty Produce app for iPhone and Android. Sharer's comments : Fresh Blanca malanga ! Sharer's comments : Malanga spotted at Whole Foods Market. Sharer's comments : Malanga spotted at Fresco y Más. Sharer's comments : Malanga spotted at Florida Fruit. Sharer's comments : Malanga spotted at Clemons Produce. Sharer's comments : Malanga spotted at heb. Sharer's comments : Malanga spotted at Winn-Dixie.